Choosing the right dog training equipment for your new puppy can be a confusing process! There are so many dog training leads (leashes) and dog training collars (or harnesses) on the market — as well as some conflicting advice. As a lifelong dog owner (and trainer for my own dogs and my friends’ dogs) I will try to point you in the right direction on which types collars, harnesses, and leashes are best for training your new dog. Initially, you might think that a collar is a collar. 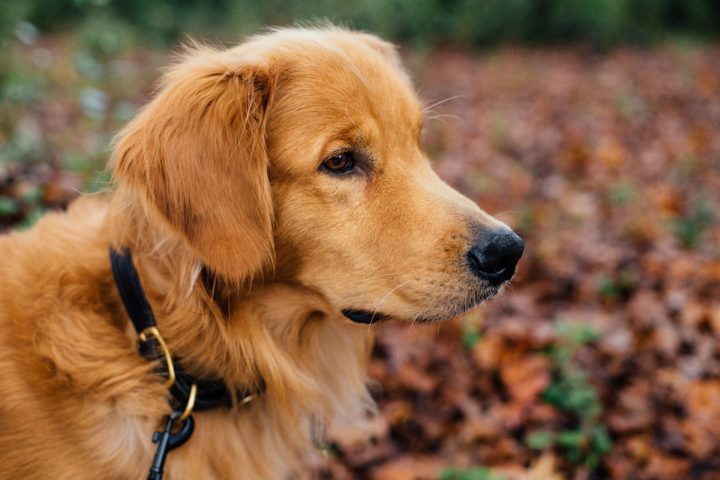 But the type of dog collar you choose actually makes a difference in terms of how easy your dog is to train on a leash, how much they pull while walking, and how easy it is for your dog to slip out of. The reason why pinch collars, prong collars, and choke collars are the subject of so much controversy is because of a shift in dog training philosophy over the last few decades. In fact, the type of collar a dog trainer uses is a surefire way to see if they are using the outdated “dominance” school of thought, or if they’re using modern training methods that are built on behavioral science. Pinch, prong, and choke collars work on this philosophy: “Do exactly what I say or I will hurt you.” This is a way to scare a dog into submission. It’s a relationship that is built on instilling fear into an animal. It’s also based on false assumptions about animal learning. Trainers who have kept up with the pace of modern dog training are more in tune with the value of rewards as a motivator to get the behavior we want from our dogs. It turns out that the carrot is much more powerful than the stick. In fact, it’s well known that too much punishment can lead to a host of behavioral problems in dogs — including aggression. Dogs trained with positive methods are more confident and they out-perform dogs that are punished into submission. This is why almost no one in dog sports uses dominance-based training methods anymore. Personally, I would recommend that you ditch the pinch, prong, and choke collars and avoid the trainers that prescribe them — just like you would avoid a teacher that wanted to smack your child with a ruler for misbehaving. It’s so… last century! Regular buckle dog collars and quick snap collars are a convenient way to keep your dog’s rabies and identification tags on them at all times. Plus, they’re easy to adjust and rarely rub or chaff — which makes them ideal to wear round the clock. They are easy to escape from. Unless you have the collar too tight to be comfortable for your dog, all your dog has to do is back out of a collar like this and they will slip the leash! They can cause injury. When your dog pulls on a leash with a regular collar, they put extraordinary strain on their neck and spine. It can be even worse if they bolt towards a squirrel and come up short and fast to the end of the leash! Lots of pet owners start with a basic round the neck collar for daily wear for the rabies & ID tags, and then use a different (better) dog collar for training purposes. As far as round the neck collars go, Martingale collars are the best — they have an extra loop that cinches to provide “limited slip”. This video shows how a Martingale dog collar works. A few years ago, there was an attempt to solve the pulling problem with a specially designed head halter. The philosophy was that just like a halter on a horse, controlling an animal’s head gives all the leverage to the person holding the lead. There were high hopes at first and many professional dog trainers got behind this new design — particularly because they were trying to get their clients to get away from pinch, choke, and prong collars. At first, it seemed like a great solution – if the dog tried to pull forward, their head would be pulled to the side, thus transferring their forward momentum into sideways momentum. Since pulling forward with a head halter never works to give the dog what they want, they eventually just naturally stop pulling. The problem is, however, that the risk of neck injury from pulling or chasing is even greater than with a regular collar. I used a gentle leader head collar with my large dogs — when I was teaching them both to walk on a leash at the same time. It helped me keep them focused on the task at hand (walking/heeling), rather than playing with each other. Once they got used to walking together, I switched to a better dog training collar (mentioned below). Generally speaking, head halters are not recommended for new (inexperienced) dog owners. While they work well with professional dog trainers and in low-distraction environments, they’re not the best option for the average pet owner. Instead, I recommend using a dog harness — combined with sound training techniques. Rather than tugging on your dog’s neck like a regular collar does, a harness tugs on your dog’s entire body (chest and shoulders). 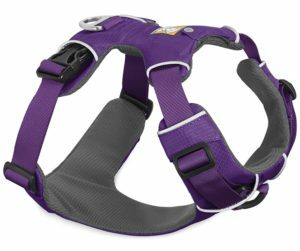 Since a harness disperses pressure over a larger area of your dog’s body, you have much more control over your dog and there’s much less strain on your dog’s neck and back. But there are so many different kinds of harnesses on the market that it can be a little intimidating to choose the right one for your dog. 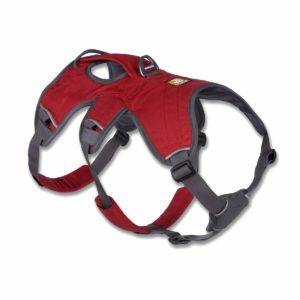 There are some really great dog harnesses that are specifically designed with the escape artist in mind! 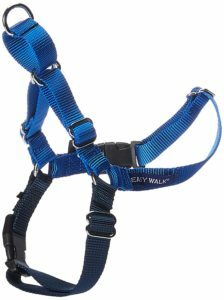 This kind of harness is also great for an active dog that enjoys hiking or long walks — because it provides some extra support for helping your dog over obstacles, as well as extra restraint for those times when your dog becomes overly adventurous. Mobility impaired dogs are best served by these sturdier designs — because you can easily help them up stairs or other difficult terrain. Here are some good reviews of escape proof dog harnesses from someone who knows… the owner of a Houdini dog! 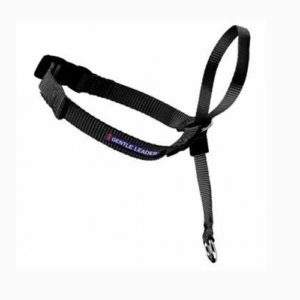 One of the most safe and effective harnesses for heavy pullers during leash training is a front clip harness. This style gives you the leverage back — using the same principle as the head halter without the risk of neck injury! When your dog tries to pull forward, the front clip will pull them to the side. If you combine this harness style with positive reinforcement for walking with a slack leash, you will find that your training time is drastically reduced… without hurting your dog. This harness design takes advantage of a front clip that is great for problem pullers. 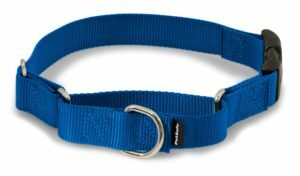 If your dog tries to pull too hard, the front cinch harness applies a slight squeeze (similar to the way a Martingale collar works) — and it pulls the dog to the side. This is a great dog training collar for small- to medium-sized dogs. Generally speaking, it’s less effective for larger dogs that are heavy pullers — because they have enough strength to force the thin webbing into a very uncomfortable pinching position. Here’s a good summary of the pros & cons of dog collars vs. dog harnesses. Now that you have the skinny on the best kinds of collars and harnesses, it’s time to think about the best kind of leash you will use for dog training. There are 3 basic types of dog training leads — we’ll look at each one, and address the pros & cons of each design. The retractable dog leash does have some advantages, although retractable leashes are typically not good for training purposes. Very handy when you’re heading into wide open spaces without other people and other dogs around. Gives your dog extra space to walk (or roam) on a bike path or a hiking trail — if off-leash is not an option. Tangle free and easy to travel with. Can be dangerous around other people, dogs, or cars — because of the thin cord that is difficult to see. 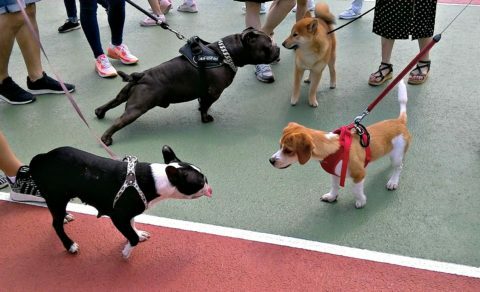 Can actually un-train your dog’s good leash manners — since there is no slack leash (to reward for not pulling) and there is an ever-shifting walking range (so your dog doesn’t learn to Heel). Expect a learning curve on this type of leash, as they are a little more complicated to use. 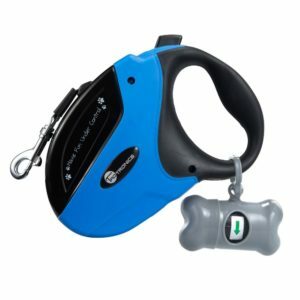 The fact that your dog can get so far away from you, and the button is your only method of “reeling” him back to you makes this a frustrating type of leash to train with. This is the best style of dog training leash to use. The ideal length is 6 feet, although you can go longer if you don’t mind your dog having a wider range on a walk. Nylon web dog leashes are inexpensive and come in a variety of colors. Inexpensive and easy to find. Simple to use. 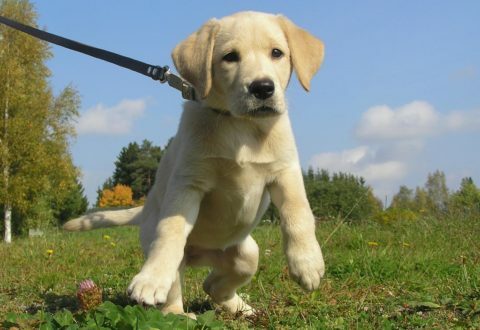 During dog training, simply reward a slack leash and stop walking whenever there is any tension on the leash. Maintains a consistent distance between you and your dog — which your dog will quickly learn. Too short for control your dog at a distance. Something that most professional dog trainers use that is missing from the average pet owner’s arsenal is this handy long line training lead. It comes in 15, 20, 30, and 50-foot lengths! It’s perfect for training your dog from a distance outside. You can safely work on Stay, Wait, and Recall while never losing the ability to control your dog should they decide to bolt. Gives you a way to control your dog at a distance — while outside in unfenced areas. Indispensable for training your dog commands from a distance in high-distraction environments. For training purposes only — this type of leash would be too cumbersome for daily walks. Needs regular washing since it is designed to drag on the ground when used during dog training. There is no collar in the world that will instantly teach your dog how to behave on a leash when you slip it on. Plan on devoting a significant amount time to learn basic positive dog training principles — so you can teach your dog what they need to know in order to be safe and pleasant to walk. By the way, some fans of pinch, choke, and prong collars argue that a dog harness gives more leverage to the dog, potentially making pulling on the leash even worse. This is not altogether untrue – without training, a problematic puller can (and will) pull harder with a harness. However, pulling with a harness on is much less likely to result in injury or escape. Since training is required no matter what you use, choose the safest alternative: a harness. TIP: I always get my dogs used to wearing a harness as puppies. When they’re really small, a puppy dog harness vest with a single velcro closure and a quick snap buckle is the easiest option. 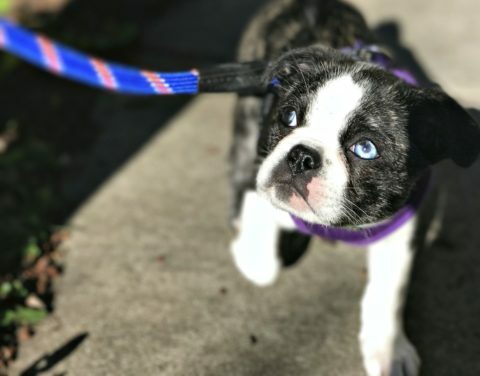 I hope you’ve found this article helpful for choosing the right dog training equipment to use when leash training your puppy. If you’re a first-time dog owner, consider taking some puppy training classes to make the most of this critical time in your dog’s learning curve. You will surely learn some training skills that will serve you and your pup for life!